The second clue for Frame 9 is posted, it appears to be the same clue with what appears to be some ivy or a hedge behind it. The image used for the background appears to be a free stock photograph that has come from a Swedish website. Thanks to James for letting us know first about the clue, and Waffle for showing us where the Ivy photo came from. Update - The Hub page has been updated so that only the merged image is displayed, move the mouse over the clue picture above to see how the clue originally appeared. Have you noticed that on the free photo site, it says you can use them for any purpose, but please leave a comment or something in the guestbook. I can't see anything from Tyson. Hoolywood and Vine..... and Tokyo ? I know it has been mentioned before but Tokyo Rose is seeming more likely. Perhaps the words are split into three not two as we first thought. I thought of Rose because of the obvious… but when I checked Tokyo Rose the outcome looked interesting, but going in the wrong direction for me. Maybe the whole thing is an anagram? Yokes Tremolo, doesn't sound right to me ! The hub page has been updated, the original clue has gone and now we just have the merged clue. Well, at least it's got Jacob in it, why not? I've updated the main post with a rollover for the two versions of the clue. When I've looked up "Tokyo Rose" yesterday, found it was one of the nicknames Sawyer gave to Sun; not sure in which episode though. "The whole camp's pretty shook up about what happened to Tokyo Rose." The name of the photographer happens to be "Magnus Rosendhal"
Hi Ellen, I'm not sure we are much further forward in terms of when or where yet. There must be a reason why he replaced the first image… did this happen before, that a hint was edited and the original removed? I think that change was just a mistake, the original should have been removed and the merged left in it's place. Or maybe he adjusted the image because we walked down Melrose Avenue in the wrong direction? I have to back my poster buddy - Fred Segal looks promising. I wondered if the image was adjusted because someone thought we were investigating in the wrong direction. Not sold yet, I haven't seen the smoking gun. To me, the ivy pic on the clue doesn't look exactly the same as the free ivy pic on the Swedish website. 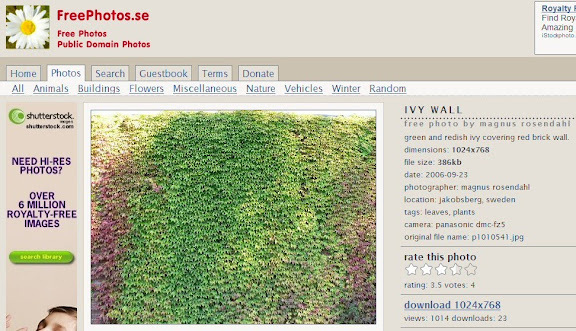 What the ivy pic on the clue does remind me of is the wall in Wrigley Field in Chicago. Hello, new to all this, but thought I would join in. Gutted that I only found out about this arg today and missed all the really great designs. Only just got back on the computer after a bad year. Anyway, I was thinking could this be an anagram? I know it's a bit lame, but I thought the word smokey fits melrose tokyo. Also, I was looking at the BAPE website and they have a store in Japan that is called the pirate store. When you look at the pics there are some similar sweaters. if you go onto the site and click on stores, then the last one in the list is the pirate store. There are three pics and one has the sweaters on. How does this work anyway? I see there are events, but where do the posters get sold? 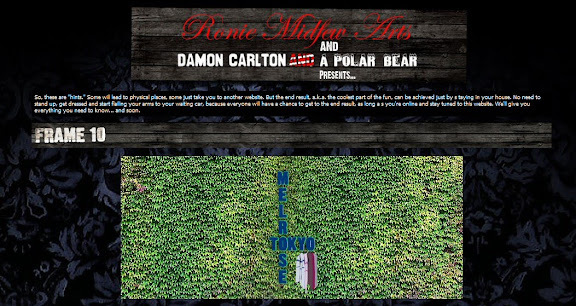 On the damoncarltonandapolarbear site or the place that the clues lead to? The Swedish website is definitely the same picture. You can tell it's cropped and Photoshopped. Hi John, yes the posters get sold on the DCaaPB site, the reveal "event" gives us a URL which shows the latest poster. Then a short while after it is announced the poster goes on sale. The last one sold out in 7 mins so you may have to be quick with your credit card. It occurs to me (and probably others) that the clothes are associated with Tokyo - so perhaps as suggested above, its an ivy covered place on melrose that has tokyo clothing. From the comments Fred Segal fits the bill. Sounds like we have some good leads, although usually by this time we know "where" and are only waiting for the "when". Guess this one's a stumper and we'll just have to wait for the next clue. Sounds like we've considered about every possibility though, so it's probably going to be something/somewhere we've (you guys) mentioned. Looking at the pics of Freds place on Melrose pretty much says it all..We'll see if the trend continues in next clue. By adding the Ivy to the background, could Tyson be telling us that the location is somewhere that didn't have Ivy before, but now it does have Ivy, similar to the star clue in poster 6? I think you're misinterpreting the clues for Frame Six. The first clue, the star, was to indicate the location (TX), and then the X to indicate the FOB concert. I see we're still confused this morning! Too many directions to go in. The two I like the most: Fred Segal (ivy covered on Melrose and they carry a Japanese designer who has a flagship store in Tokyo) and Chicago (ivy covered wall from Wrigley Field is pin-pointing the city...there are a lot of Melrose named restaurants/diners, but I can't find a Tokyo connection or hanging sweaters connection). Here's a connection between Tokyo and Chicago, although it probably has nothing to do with the ARG. Both were recently rejected in favor of Rio as sites for the 2016 Olympics. Again, guys, really, what's the purpose of throwing red herrings like Chicago into the discussion? It's not Chicago. I don't think it's a red herring, Amy Lynn...just another possibility. We don't know anything solid yet!! your welcome MEL. I think many caught onto the obvious way way way way way way back in the hundreds of comments. Again, LA ARG followers, lurking or not, be prepared! But don't take it from me, listen to the mountain goat! Think of it as a free-association exercise. We're not really getting anywhere on the L.A. connection. What I mean is, based on the clues, we've determined that the reveal is most likely happening in L.A. at one of the previously mentioned clothing stores (most likely, at this point, Fred Segal's). At this point there's not much else that can be done on that front unless one of two things happens. 1) Tyson gives us a new clue. 2) Someone calls Fred Segal and gets one of the employees to slip up and tell us when the reveal is taking place. Therefore, to fill the time, we can figure out if there is anyway the clues could be pointing us to somewhere else. In a way, it's sort of like watching the show. Until TPTB tell us otherwise, almost anything is possible. Amy, I don't think we have anything confirmed yet, just a lot of very strong suspicions. If we could find the sweater pic that would confirm it for me. I've looked through loads today from the shops mentioned above and not found it yet, I haven't given up yet. Zort70, clothes image most likely stock photo like background to tell us that Tokyo is related to clothing, not city. ReverendMilo, if you persist in linking images of me, my family or any of my very distant relatives in this fashion I will be forced to take necessary action resulting in long, bleating tirades which do not intentional but only seem to sound vaguely similar to your libelous link. andyschex is reporting the delivery of package via FedEx. Can he leave work to retrieve? Will he drive safely, or will he Grand Theft Auto through tiny town in southern Louisiana? More on this story after a brief message from Mr. Cluck's where we put the chic back in chicken. I'm not gonna go through all these comments, but has anyone suggesated Tokyo Rose. I'm not sure it would be familiar to the younger generations [i'm 32]. Google Toyko Rose. Not sure if it's relevant or not, but there ya go. Also, I think Sawyer called Sun Tokyo Rose once, so maybe it's not as irrelevant as i'm thinking. Just throwing that out there. Random question: What does WFTB stand for? I keep seeing in in regards to LOST on twitter. Frank, yes it / she has been mentioned, although we don't know where the Mel part of the clue fitsd in there. comixguru, can you use this in a sentence, and I will give your the Disney or the mature audience def., or google for your own enjoyment. Comixguru, I think it means Watch From The Beginning. Zort70, andyschex is reporting gifts and new land speed record from office to home. Oceanic Airlines t-shirt and signed DC. Pictures coming to you soon. no mention of letter clue. It took me a while to figure out TPTB meant "the powers that be"
I'm new to this, so forgive my ignorance, but does it just illustrate that this is the "live game" frame? mrtibbs- yes, whenever that pic pops up in frame, we know they have started dropping clues for the next poster. If you want the meaning of the photo, go back to the home page and click on the archives- you have to go all the way back to the Aug. 15 post or so, but the explanation is there. MELROSE is a famous fashion bland from Tokyo, Japan. If this is going to happen in Tokyo, I will follow up. I just had it on mute and wanted to see if it would show anything we might recognize, and I saw the ivy on the wall along Melrose Avenue. just something new I thought I'd share. I think I may have found a connection between BAPE and Ivy, thanks to Google StreetView. Here is a screen cap I took of the area behind BAPE in L.A.
Perhaps Tyson is planning another party-type event, like the first reveal, and it is going to be held in that parking area behind BAPE? comixguru - the Lostaholics re-watch podcast is REALLY good, too. Thanks Amy and Mrs Z! @jeremy138 - Unfortunately, Google StreetView can be very old. We have no indication that the dumpster, or the ivy for that matter, are even there any more. High fashion? Will it be Joop-jeans or Fred-fedora? @jeremy that is true! I wish i lived closer to LA. I'd drive by and see if the ivy was there. Tazz the Furnace here, and I'm convinced that BAPE will be doing something re: frame 10. High fashion? C'mon that's a dead giveaway. @LotteryTicket - lol I like. I'll have to sign off my posts with that. Just a thought - high fashion could be a play on words - high as in top floor of a multi-floor building. Hiroki, welcome to The Lost ARGs. I have visited your blog page and enjoyed your comments. Can you give us a link to MELROSE fashion brand? Thanks. Anon metioned Marc Jacobs earlier. I kind of like that. Pooh at Dark's forum posted this picture. Plus marc jacobs has a Tokyo store. Stay Up, Fred Segal's has 'upstairs' or loft showroom. Somewhere out there is a picture of Pete Wentz climbing the stairs. Andy - fantastic pics, congratulations. Hiroki, welcome along, glad to have you on board. It would be great to have a friend in Tokyo to follow up on these clues if they lead us to Tokyo. Sorry, kind of off topic, but everything seems to be running on U.S. time. I was wondering what time (west coast as I know it's an eight hour time difference!) do the clues and prints come out? Just want to know if i'm going to have to do an all nighter to get my hands on a print!!! The prints have come out at all different times, but many of them were at 1pm EST, 10am PST. Holy COW! !..I swear the one ivy leaf has changed colors!. It was green , now its Yellow.! I figure its a new clue,,so I turned up the gain for high contrast on the screen,,and sure enough,,a secret message in the Ivy is now complete! It says J Ryan is realeasing a new print on his site,,sometime Thursday!! Be sure to be there for the suprise.!! How they fit all that in the ivy I'll never know. I meant the 5 day wait for the first clue, or whatever it was. ..Is there a medical marijuana outlet there on Melrose? Where is everyone seeing the "high fashion" clue? It was on Andy's letter that he posted. Looks like their's something in the foilage. Welcome to Hiroki! Great to have LOST fans in various places worldwide to cover all the bases! Congrats to Andy! I STILL haven't gotten my "Hatch" poster! Out of interest, does anyone know if any of the first order prizes have gone to anyone outside the US, because i'm wondering if there's any point trying. Couldn't exactly see them shipping that Bass guitar internationally, would cost a bomb. Still waiting on my Hatch too but live in UK. As for the clue, i'm stumped as per usual, but more so than normal. I don't have the fastest internet connection in the universe, and the Hub page is starting to take a REALLY long time to load all the previous frames' clue images and info. Maybe they can clean it up a little--by the time we get to frame 16, it's going to take an hour just to load the page. Taking "high" literally, if there are any tall fashion-skewing buildings in that area, with some kind of display at rooftop level ("high")-be it lcd screeen, billboard, news scroller etc.- they could, hypothetically, display the url there at a given time. Do all the storefronts on Melrose have ivy on them? Fred Segal does, and so does Marc Jacobs. I just checked my poster status from Transmission and its now showing "Shipped". So maybe by the end of the week? Yay!! My poster status for Rousseau´s Transmission also says "Shipped" :) It will take longer for me to receive it because I live in Spain but anyway... can´t wait! Sayid'sGirl: I wish I was an expert on Melrose stores! But, alas, I'm a J.C. Penny's girl! LOL All I know is ivy is pretty common out here! @ Roswell....how are you checking the status of your shipment? It's so frustrating that there's no tracking number on our orders! My "Hatch" has said "shipped" for a week! @Andy and @ Roswell...thanks you two! In a previous email exchange I had with Tyson, regarding my Dharma Van print, he told me that, and i quote: "we will have to ignore any emails about mailing status before the 3-4 weeks is up since the date of your purchase." Again, I have no idea if that applies to customers in all regions. I agree, every time I drive past a post van, I think, I wonder if it's in there. The wait is agonising, I don't even know if it's in the country yet. Me too. Thanks. I guess I shouldn't assume just because you live near the area the you live the "lifestyle". Sorry you haven't got your Hatch print yet. But you could wait up to 3 more weeks, but probably not. Following along for past 2 days - work interfering with my personal interests again. Good detective work everyone. I got desperate enough to go out and plug in a mosquito zapping light that's in my yard that has a blacklight bulb. After getting home from work, I walked out there in my PJs last night with my Hatch poster to see if there was anything else to see. The answer is NO. And if any of my neighbors were up, I'm sure I've now convinced them I'm crazy. @maven, @Martyn - I'm with you in the agony booth. Still waiting for Smokey to arrive. (I'm in Canada too.) Should be any day now, so I find myself checking incessantly for mail trucks. I know I should try to forget about it and be pleasantly surprised when it arrives, but can't quite convince myself to do that. @sandman90 - LOL I know exactly what you are talking about. I was telling some friends about the posters, the clues, and the prizes. They shook their heads and said "we used to consider you the sane one of the group". When I told friends I'd enrolled in Lost University and even joined a fraternity, they said, "you've finally gone over the deep end." me thinks the r button is on the fritz. ..Did you know that if you stare at this clue long enough, the ivy starts doing the Hula? Melrose Ave, LA is known for many shops with ivy on the walls. So that alone doesn't give us a definite store location. I like the LotteryTicket's Fred Segal suggestion. But with Marc Jacobs having stores both on Melrose and in Tokyo, that seems possible as well. Have all of the previous 1st order congrats letters carried clues to the next frame reveal? Just got my smokey print down here in South Australia and it is beautiful! Number 255 if anyones counting. obfusc8, Fred Segal was discovery of many, I'm just the loudest promoter. scottbphilip, halllooo down under. Yes, we are counting. If you are not on the forums at DarkUFO, then just leave information here. The Official Poster List is on the DarkUFO/ARG thread board. MEL, I see that you are having an interesting evening partaking. obfusc8, yes all letters have clues to next poster reveal and in some instances we are also finding extra or missing letters (of the alphabet). Zort70 is preparing special post regarding these subject. Geez I saw this one go up, literally. RH Restaurant is inside the Andaz Hotel on the Sunset Strip (its the former "Riot House" as recreated in "Almost Famous" - they'd be into this sort of publicity). RH also stands for Restoration Hardware... but none on Melrose, closest inside the Beverly Center. And if you googlemap the Fred Segal store, the url that pops up is ronherman.com. But really, RH are my initials. Obviously, the reveal is taking place in my apartment, which does have some ivy outside. I own sweaters, I guess we could watch melrose place and a movie set in tokyo. It all fits together so perfectly, how didn't I see that! Ron Herman used to be a buyer for Fred Segal. Yep, and Ron Herman has a location in Tokyo as well. Yep, we need to contact Hiroki Tojo. I'll put a note on his blog to hop over and follow our conversation. It'd be hard to schedule a reveal involving both branches...I think a 15 hour time difference. Would they have the next reveal at the Toky store only -- or another LA reveal? CITIZENS OF HUMANITY fetes the launch of their pop-up shop at Ron Herman on Melrose Avenue in Los Angeles with a shopping event on Saturday, October 24th. The premium denim brand and celebrated boutique have teamed up to create a one-stop shopping destination where customers will be able to find the best of everything CITIZENS OF HUMANITY has to offer this season. Ron Herman will also be launching their brand new Jean Bar expansion to coincide with the launch of the CITIZENS OF HUMANITY pop-up shop, which will be up for approximately one month. For the first 100 customers who make a CITIZENS OF HUMANITY purchase the day of the event, CITIZENS OF HUMANITY will offer an exclusive and limited edition tote bag stuffed with the latest fall beauty products and must-haves from brands like Jonathan Product, Beauty.com and Bristols6. Also during the event, customers can also enter for a chance to win a $250 Ron Herman gift certificate. Could be a crowded place if this is when/where the reveal will be. There would be NO problem for both US and Japan Ron Herman locations to reveal. Just a time zone issue from my point of view. We have a friend, Hiroki in Tokyo. I sent him Twitter message. I don't think they are holding for Saturday, it will go Thursday a.m. most likely. Or, heaven forbid, another quick strike like Buenos Aires. Almost 2 in the afternoon in Tokyo. The Ron Herman store in Tokyo just opened in September. Los Angeles and Tokyo are definitely having a bit of a fling. Kitson opened a branch in a Shinjuku department store in March, Opening Ceremony has plans for a Tokyo shop this fall, and now Ron Herman is joining the party with its first non-California store, set to open in August in a residential neighborhood called Sendagaya. (The location's not totally remote—it's near world-famous shopping district Harajuku.) Herman explained to WWD that he wants to export his brand's LA vibe to Japan, rather than let the local style influence the way the boutique is set up. That means even the small details, like the shrubbery out front, will resemble their counterparts in the LA stores. Ideally, this will be the first of many international Ron Hermans—the company now has its eye on Europe and the rest of Asia. These are all fabulous finds! Good work! Maven, are you up for shopping on Melrose Ave? Thurs. & Fri. are really bad for me...I have commitments I can't get out of. Most likely the time is 10AM when the store opens. Plus rush hour traffic is horrendous at that time! I hope we have some other LostArger who lives closer. Sat. would be easier. An as-public-as-I-can-make-it Thank You to Salvoh for being so generous as to mail one of his IThinkThatManWasYou.com bookmarks to me. "You've got to give it away"
@LotteryTicket -- Live chat fols probably aren't even at RH...off site somewhere. Hmmm....maybe if I call the Tokyo branch? My bad...that's Live Chat with a STYLIST...stylin' LotteryTicket? Yeah, but that would be a Hi-larious conversation. Ditto The Kharma Initiative as Salvoh was kind and generous to me as well. We'll get Hiroki to make the call. Bet his Japanese is spot on. Victoria: Hi. How can I help you today? Lotto: Hello, Victoria. I was stranded on an island for 108 days wearing crash survivor's clothes and shoes. And while there was plenty to choose from I never want to wear tank tops, cargo pants and hiking boots EVER again. Can you help? Victoria: Sure. Ron Herman carries high fashion name brands that appeal to women of today. Lotto: I have one other question. I need to make contact with Melrose Avenue location. I believe they are in-league with Ronie Midfew Arts and have the top-secret web address which will bring happiness to many around the world. What did you expect LT, you were warned not to utilize the computer for communication with the outside world. Look closely Lost fans the clue has been updated, it now shows (Friday) next to Melrose, and (Saturday) next to Tokyo.